MONTREAL - Canada is a great enabler. For years it has served as a virtual way station for travelers, allowing them passage to Havana without running afoul of US travel restrictions. Now it is making possible a journey through Cuban art. The prestigious Montreal Museum of Fine Arts is hosting the most comprehensive retrospective of Cuban art ever held outside Cuba's borders. More than three years in the making, the show surveys some 400 works by more than 100 Cuban artists. More than half of the works were brought from Cuba; the rest are on loan, largely from private collections in New York and Miami and museums, particularly Manhattan's Museum of Modern Art and the Arizona State University Art Museum in Tempe, whose holdings of Cuban art are the world's largest outside Cuba. Paintings and photography dominate, but sculpture, poster art, music, video, magazine covers, installations, films, even cigar wrappers make an appearance, all with the objective of capturing Cuba's elusive national identity, or "cubanida." It is an ambitious task. For historical perspective, the museum has subdivided the show into five categories: colonial art of the 19th century, interwar avant garde, the post-World War II renaissance, revolutionary art after Fidel Castro's rise in 1959, and the caustic conceptualist art that has emerged since 1980. Each section begins with photographic close-ups of the people, conditions, and mood of the era, which is an education in itself. Murder victims slumped on the street, an unsmiling Ernest Hemingway in a bar, prostitutes waiting for customers. Girded with these impressions, you then see the period through an artistic lens. There are dark-haired beauties and strong colors, which you would expect in Caribbean art. Less predictable is the originality of the work, the result, in part, of the island's geographic isolation. The big surprise is how good it is. For Nathalie Bondil, director of the Montreal museum, it was a revelation. Having accepted an invitation to visit Havana's newly renovated Museo Nacional de Bellas Artes, the French-born art historian was astounded "by the scale and quality of the art," she said. On a whim, she proposed an exhibit. In the three years that followed, Bondil traveled to Havana eight times. Bureaucracy was minimal, she said, as unlike the United States, Canada enjoys good relations with Cuba. But the magnitude of the undertaking raises questions. Why, with Castro ailing, would Cuba roll out such a candid look at domestic achievements, hopes, and disappointments? Could the regime be loosening its grip? The timing was "nothing political," Bondil said. She acknowledged Cuba's current drive to spur tourism, saying more Canadians visit its ocean-swept beaches than any other nationality. Bondil's motive was simple: to take the lid off Cuban culture. To make it happen, Montreal has picked up the tab. The museum has added several pieces to its collection and is keeping the door open for future collaboration. Meanwhile, it is turning the show into a veritable Cuban celebration. Ongoing events include lectures, tours, and a Cuban film festival, including "Strawberry and Chocolate," an Academy-Award-nominated 1995 comedy about homosexuality. A 424-page catalog is being published in English, French, and Spanish. In its five chapters, some artists are given long-deserved recognition, like Marcelo Pogolotti, who produced hauntingly colorful avant-garde work in the interwar years. Authored largely by Cuban scholars, the essays don't mince words. Discussing a contemporary artist's habit of ridiculing political propaganda, for example, Panama-based art critic Gerardo Mosquera laments that political slogans "have reached heights of absurdity comparable to North Korean standards." The subtext is hard to miss. One is the message that there's a lot more to Cuban culture than crumbling facades and 1950s-era American cars. The fact that Canada is hosting the exhibit and not the United States, even though US institutions have larger collections of Cuban art, is a subtle reminder of the price the US public is paying for the embargo. Havana boasts a world-class art academy, an esteemed photography school, and an impressive, if little known, art scene. Little known, that is, except for Wifredo Lam (1902-82), who ranks among the 20th century's leading painters. A whole gallery of the show is dedicated to Lam, a surrealist and Picasso protégé who died in Paris and whose paintings are stylistic hybrids reminiscent of Joan Miró, Fernand Léger, and Wassily Kandinsky. Born to a Chinese father and an African-Cuban mother, Lam spent most of his life deconstructing the Afro-Cuban aesthetic. He lived many years in Europe, but returned to Havana in the 1960s. In 1967 he orchestrated one of Cuba's greatest artistic moments, the collective painting of a massive pro-revolutionary mural. 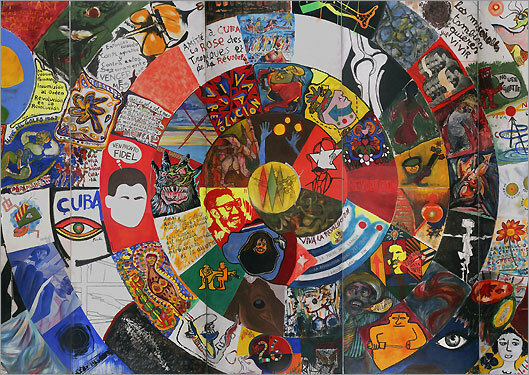 The canvas, a patchwork of images radiating outward in a great spiral, was the handiwork of some 100 Cuban and foreign writers, painters, and intellectuals. Each was assigned a square; number 26 was reserved for Castro, but he never showed up, so the square was left blank. This is the mural's first appearance outside Cuba. One of the show's biggest revelations is how tolerant Castro has been of provocative art. Though dependent on Soviet subsidies, the Cuban leader eschewed Socialist Realism. And though artists were censored and even jailed in the 1980s and beyond, their defiance was not quelled. "Castro was always open to abstract and Pop Art," Bondil said. "It was completely different from the situation in Russia." When the Soviet subsidies vanished, living standards dropped, and works of art became even more politically abrasive, taking aim not only at Castro, but at the United States, too. A display called "Cuba, Island of Fiesta and Siesta," parodies the Cuban stereotypes pervasive in US society. But with Florida only 90 miles away, the US presence remains a constant in Cuban thought. All the more reason to hope that a similar show opens in the States. "I must say that the lenders have been especially touched and happy to collaborate with us on this show," said Bondil in an interview published in the January issue of the museum's magazine. "The passion for Cuban art transcends all borders." Diane E. Foulds, a freelance writer in Burlington, Vt., can be reached at dianefoulds@burlingtontelecom.net. Open Tuesday 11 a.m.-5 p.m., Wednesday-Friday 11-9, Saturday-Sunday 10-5. Adults $15; seniors 65 and over and students under 30 $7.50; children 12 and under free. "¡Cuba! Art and History From 1868 to Today" runs until June 8. A chandeliered classic with king-size beds, marble bathrooms, and the elegant Café de Paris. Rooms start at $156. Contemporary style in a historic part of Old Montreal. Rooms $179 and up. A converted townhouse a few blocks from the museum; continental breakfast included. Rooms $70-$150. Intimate, Parisian-style breakfast and lunch spot in the Outremont district on the far side of Mount Royal. Lunch $7-$14. Moderately priced casual bistro in a bohemian quarter; daily specials. Entrees $12-$24. Superb but pricey Greek specialties; the best fish in town. Entrees $36-$40.